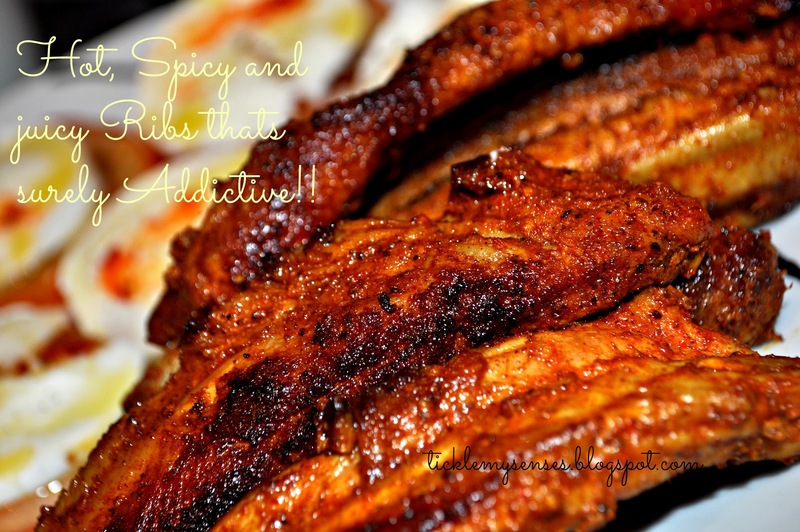 Tickle My Senses: Goan Pork Ribs and a Free CookBook?? Well a lot has happened since my last blog post. My Cookbook Giveaway which began early this week is well underway. (If you missed my last post I am giving away "Annabel Karmel's 100 Family Meals Cookbook" to one lucky reader. Simply enter to win here. Also "Tickle My Senses" has been Nominated in the "Best Food Blog Category" at the fourth annual Mum and Dad Blog Awards, in association with Parentdish.co.uk , the UK’s biggest and most exciting awards for parent blogs. I feel so blessed and honoured to be a part of so many lovely mom and dad blogs out here in the UK. Thank you readers for nominating me! 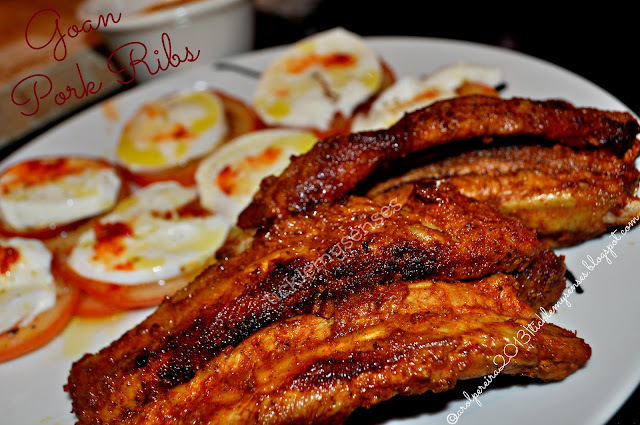 We love Pork ribs, as they taste so good no matter what you do with them. 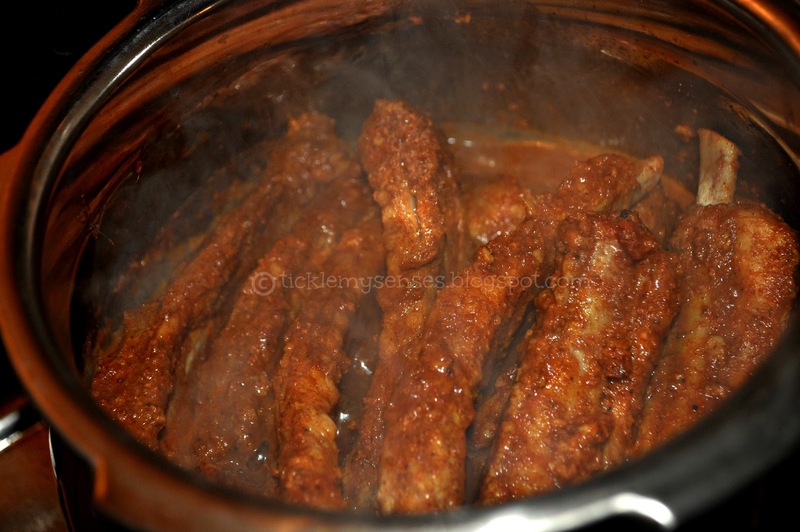 Until recently our favourite recipe for ribs has been the Simple Chilli Pork Ribs. But after discovering this Goan Preparation, we have 2 favourite styles of having ribs....slurrppp!! 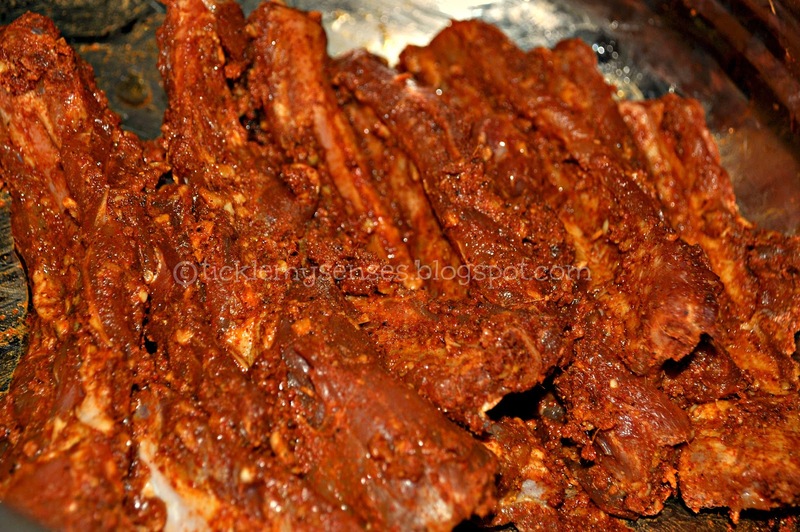 The ribs were left to marinate for a couple of hours in the wonderful hot Goan spice paste. They were then cooked in a pressure pot till nice, tender and juicy. They were then lightly panfried until it started to char and caramelize and doing so added a ton of flavour and a really nice texture to the ribs. 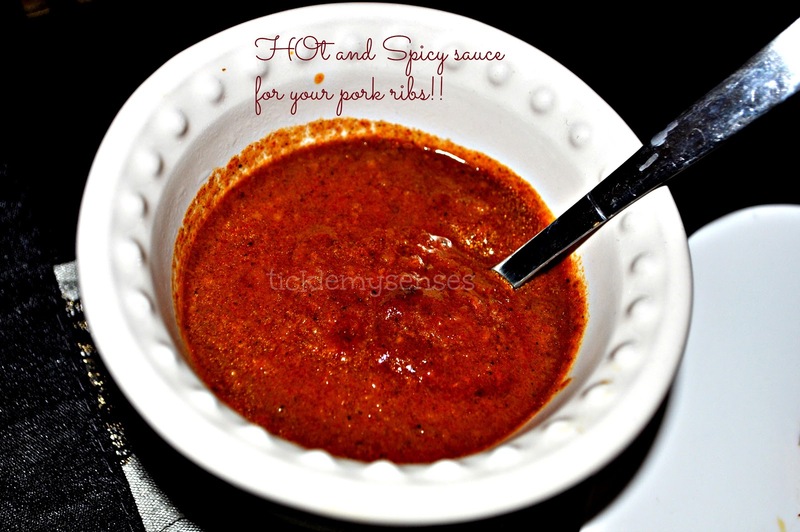 I reduced all the wonderful juices in the pressure pot to make this hot, spicy and tangy dipping sauce which when served along side the ribs heightened the flavours of the ribs. Truly delicious accompaniment to drinks when having the boys around, Bachelors make note!! or as a meal along side some chunky potato chips and a healthy salad. Do give these ribs a go and drop me a line, I would love to know how you got on!! Serves: 2-3 when served as starters. 1. Prepare the marinade by mixing all the spice powders together and then adding vinegar to make a thick spice paste. Add salt to the marinade, taste and adjust. 2. Apply marinade well to the pork ribs. Keep aside to marinade for a couple of hours or an hour at the least. 3. 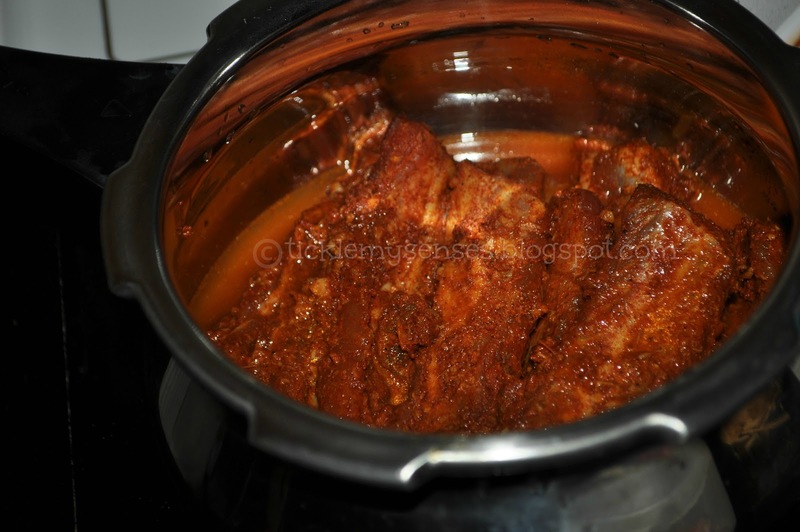 Place the marinaded ribs along with 1/2 to 3/4 cup of water in a pressure cooker and allow to cook for atleast 5-6 whistles on a medium flame or till really soft , tender and falling off the bone. Turn off the heat. Let the pressure drop naturally. Open cooker and check the ribs for doneness. Then keep aside in a plate. 4. Allow all the lovely juices collected in the pressure pot thicken by placing pot back on the fire. Adjust seasoning. 5. In a non stick pan take 2 tsps oil and when hot place the ribs in a single layer meat side down first. When browned on one side turn over and brown the other side. Place on a platter serve with slices of lemon/lime, the dipping sauce, a healthy salad and chunky chips. The chilli powder used here is Kashmiri or Bydagi chilli powder which has a lovely deep red colour and mild heat. If using any other chilli powder halve or reduce the quantity accordingly. If you haven't already, Enter here to win http://bit.ly/XE2xNp. If you do have friends that would love to win this book do share this link http://bit.ly/XE2xNp with them. I tried and it turned delicious. I had a hard time to get a quick pork rib recipe. Thank you for posting this recipe. The picture you posted motivated me to do it. So glad you liked the pork ribs and the picts. Thankyou for you feedback. Hope you find many more recipes you'll enjoy.